Many residents are still trapped in the rubble as another building comes crashing down in a community in Lagos state. Several people have been trapped in another building collapse on Lagos Island, Lagos. 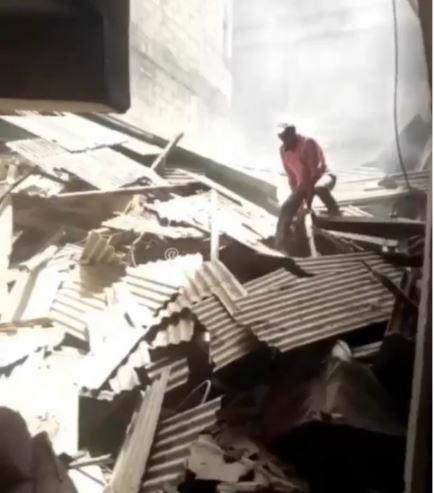 According to Punch Metro, officials of the Lagos State Building Control Agency were demolishing another house beside the building when the incident happened. The Director of the Lagos State Fire Service, Rasaki Musbau, who confirmed the incident, said firefighters from the Sari Iganmu division had been deployed in the area. He promised to call back with more details. The Lagos State Police Public Relations Officer, Bala Elkana, said the police had yet to be informed. “But I am aware that Lagos State is demolishing some houses,” he added.